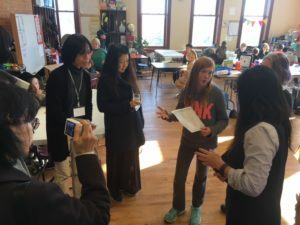 Recently a group of Japanese educators came to visit EdVisions schools in Minnesota. I witnessed them question a panel of students from the Minnesota New Country School in Henderson. What I found interesting was that most of the questions were around the perceptions of the students as to their social and emotional state as a result of being in this school. Interesting also were the answers. To the students, what turned them around as non-performing students to performing students were the relationships formed with their advisors and each other. The advisory-based, project-based school completely turned relationships from teacher centered to student centered. Visitors from the Institute of Project-Based Learning in Japan talk with an MNCS Elementary student about her project. The usual teacher-to-student relationship is the teacher tells, the student listens; the teacher designs the lessons, the student follows along with assignments; books and other curriculum guides designated what was to be learned; the teacher governed behavior based on students “going along”; assessments were created from teacher made material, always with right and wrong answers; expectations were expressed in grades, hours, and courses “passed”. These relationships create an “us-against-them” mentality. No autonomy, no sense of belonging, only a mastery goal orientation, with students competing for grades and recognition. These relationships actually inhibit learning. Authentic tasks and experiential learning are more compatible to how the brain works. 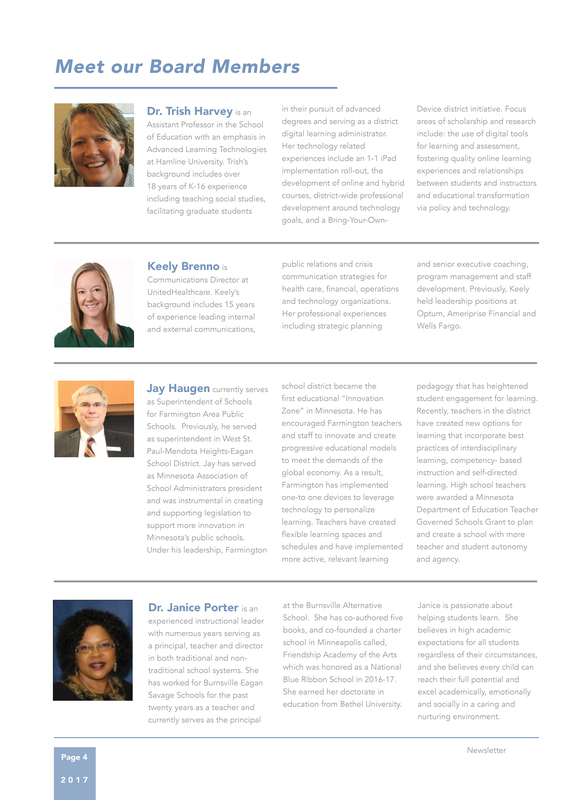 By fashioning a process-oriented, student-driven, project-based system of learning, tied to state standards, EdVisions has changed that paradigm from one of authoritarian teacher-telling, to intrinsically motivating teacher-advising. The present course-based system is predicated on the belief that not all children are going to learn and some naturally will fail. 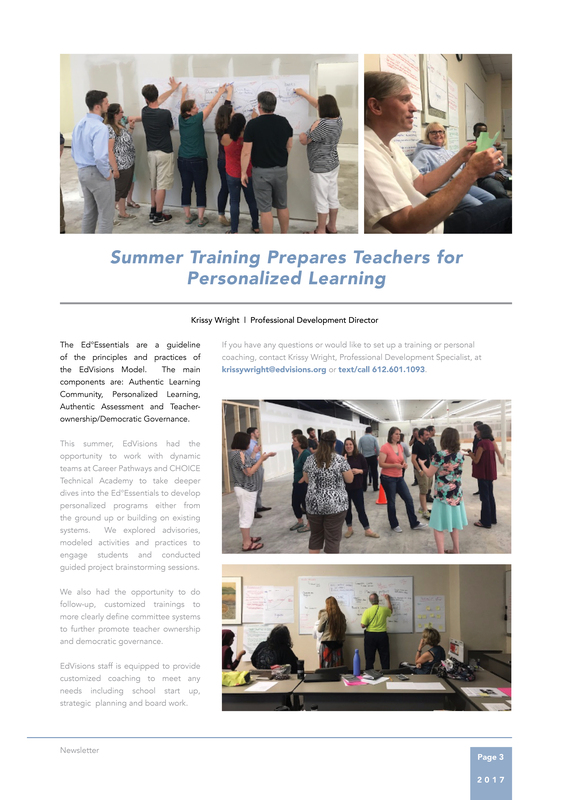 Taking into consideration personalizing learning styles and utilizing self-interest, EdVisions schools have found that all can learn if the system is not course and hour based. With a high degree of active participation, allowing for greater student choice, students become intrinsically motivated. Students become transformed by an education that matters to them personally. MNCS Elementary students share their work with a visitor from the Institute of Project-Based Learning in Japan. Taking time to create a community of learners who work together does not take away from learning content, and fosters greater ability to collaborate and interact with others. Not only advisor/teachers, but also other students and the greater community. Students learn to collaborate, respect other’s opinions and interests, become more willing to help others, and learn to express themselves well. Project-based and place-based learning does not mean there is no rigor. They actually allow students to go deeper than the shallow course-based curricula of many high schools. Abstract exercises of the mind without authentic context do not lead to deep learning. Important skills and content are best developed along with contextual learning, such as happen in project-based learning. Rigor is involved with students learning what they are interested in, and core knowledge is inherent in real-world activities of project-based learning. When asked how do we transform a school to where students are socially and emotionally engaged, and how can they institute project-based learning, I always start with “change the relationships!” Change how teachers interact with students. Give them more autonomy, let them study what interests them, learn what is their preferred learning style and how they best perform, so as to allow intrinsic motivation. Allow students to do independent learning, interact more, and do more outside of school. Require more adult-like behavior from them, with academic and personal support, and do so where there is no “us-against-them” mentality. And if it takes changing the whole structure of how school is done, then do it! But always remember that you must change the relationships; that is the number one priority. Guest post: Why Are My Students Shutting Down? In today’s blog, Hope Gover shares students’ ideas on how teachers can motivate and inspire learning through authentic relationships. Hope Grover has taught in both traditional and charter public schools in Minnesota. She has a masters of arts in education from Hamline and completed an educational leadership program at Minnesota State University-Mankato. She attended high school at Minnesota New Country School, an Edvisions partner school and has written and presented on topics related to personalized learning. She specializes in music education. Why Are My Students Shutting Down? Being an advisor can be the most exciting, frustrating, influential, and mind-boggling job an educator may choose to pursue. Think of those glorious Mondays and Tuesdays when students were researching brilliantly, collaborating like mad, and blowing your mind with their sheer creativity and ingenuity. It seemed as if the edges of the universe could not expand fast enough for where these students are headed! And then, Wednesday came and it is as if the previous days had been a complete figment of your overactive imagination. Those same UNBELIEVABLY AMAZING students were replaced by moody teenagers who only wanted to watch YouTube videos, send text messages, and respond in single words or grunts. What the heck happened? It is logical to run down a list of possible reasons for this sudden change: A. woke up in an alternate universe, B. made a very bad fashion choice, C. the students were replaced with drones, or D. the students have a personal issue that they need to work through before being productive. Since most schools do not have meetings set up with Stephen Hawking or Lucas Enterprises, we can count out A and C. Assuming that D is the correct answer, students are fortunate to attend an EdVisions school-where their advisors know them well and are willing to sit down and talk to them nearly any time of the day. EdVisions schools have a benefit over a traditional school due to their small size and focus on a student-centered authentic learning community. This allows students and staff members to feel safe and valued within their school. This becomes extremely important when advisors are working with students who are struggling through a rough “Wednesday” or for new students arriving from a setting where they have previously been unsuccessful, unvalued, or unsupported. Students in a strong advisory system have a strong sense of comradery within their advisory group with their peers as well as their advisors which allow them to both feel safe and take risks. This safety is a key facet to the communication between advisors and advisees that is crucial to maintaining the careful balance of productivity. In working with and researching project-based learning, there are generally four different reasons that can affect productivity enough to cause students to shut down. The first occurs when an advisor breaks one of the “hidden curriculum” rules. The second reason occurs when a student reaches the most difficult part of the project process [for them]. The third reason occurs when the student has something in their personal life that is so important or distracting that it encroaches on their schooling. Finally, the fourth reason is simply because they are a teenager and their hormones are all over the place-they don’t know what they want to do. For the sake of this blog, let’s discuss the first reason. Thus, when meeting with a student on a said “Wednesday,” first check and think through this list. Perhaps, make a list of the “hidden curriculum” for your own school if this list does not accurately apply. It is important to remember that in the grand scheme of the universe, we can only control what we, ourselves, do. Therefore, if we ensure that we are accomplishing our piece of the puzzle correctly, we have eliminated one adversary and ensured one support structure for our students. In closing, remember that regardless of where you are teaching, we all have had (and will continue to have) days that feel like we have entered the Twilight Zone. Our students are amazing, but they are teenagers. It is important to remember that the best way to help our students is to respect them, value them, and talk to them. Be awesome! Guest post: What is Innovation; Why do we need to Innovate? This week, our guest blog is written by Robert Wedl. Bob served as Minnesota’s Commissioner of Education in the late 1990’s leading Minnesota’s innovative standards and measurement initiatives, electronic data collection systems and new finance models including having revenue following students to the sites they attend. In the late 1980’s and early 90’s while serving as deputy commissioner of education, he was a leader in the development of much of Minnesota’s choice policy including open enrollment, post-secondary enrollment options, “second chance” programs and the nation’s first charter school law. He was an administrator in North Branch and Minneapolis and was the first Education Director of the Minnesota Reading Corps. 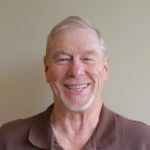 Bob taught at the University of Minnesota, St. Thomas and Concordia and is a Senior Fellow with Education Evolving. What is Innovation; Why do we need to Innovate? I am delighted to be writing this column for the EdVisions blog. Thanks Dr. Snyder for this wonderful opportunity. The focus of my column will be on innovation and the redesign of education. That will include the need to redesign the mission of education. Our current system was based on the needs of the 20th century when a high school diploma was, for many, a terminal degree. Educators like to think of ourselves as being innovative, but actually education, like most organizations in both the public and private sector, is quite cautious about doing things much differently. And with good reason. We are dealing with children and youth. When educators think of ourselves as “innovators” the focus is likely on “improving what is now.” That actually isn’t innovation. Innovation is new and different. Innovators are actually often laughed at. “Get a horse” was a common jeer at the onset of the automobile. Peers frequently pressure colleagues into conforming if they stray too far from the status quo. Wanting to do things differently somehow is interpreted as being critical of the current practice. But education simply must research and redesign new models of schooling, new curriculum designs, new ways to lead and manage, new governance models, new financing strategies and clearly new evaluation and accountability models. Each of these will meet with resistance as is always the case when real change is discussed. “Well that won’t work with everyone” or “MDE or the feds will never let us do that” or “We need to study that more” is intended to stifle the redesign discussion. Let’s look at what I believe “innovation” is and also what it isn’t. Look at education through various lenses. First is “evidence-based.” For something to be “evidence-based” it requires support with hard research with an adequate sample size and also control groups or at least a matched sample. Before becoming an “evidence-based practice” the practice may well have been an innovation. Clearly project-based learning was as were PSEO, early literacy models, MTSS and PBIS. Education actually does not have many strong “evidence-based” practices. Second is “research-based” and education does have a plethora of research-based practices. But the “research-based” bar is not a rigorous standard. Most everything in the curriculum sales catalogue says it is “research-based and tied to standards.” That doesn’t say very much. Third is “promising practice.” These are strategies that teachers use and find to be effective but there are no organized studies or data behind the practices other than teacher-judgement which clearly is of value. Innovation is a fourth category. Because innovation is new and different, it does not have an evidence or research base. New things don’t. But that by no means suggests that innovation is an “off the top of my head” idea. Rather, innovation must be carefully designed and be based on a sound hypothesis which will be tested using rigorous research practices. 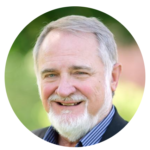 In Ted Kolderie’s latest book titled, The Split Screen Strategy: How to Turn Education into a Self-Improving System, Kolderie speaks to continuous improvement and redesign as the “split screen strategy.” Kolderie suggests that we cannot do one or the other. Rather, we must do both. That is how the system gets improved. Until recently, the chartered sector of public education was the research and innovation sector. Project-based learning, teacher-powered schools, age three to grade 3 schools, career academies, new governance designs where teachers held the board majority, use of direct instruction, etc. But in the past several years, the district sector is beginning to move more rapidly toward a reform agenda as well and state legislatures and the federal government are slowly giving permission to both improve what is as we also research redesign. The Minnesota Legislature enacted the “Innovation Zone (IZ)” law in the last session. I preferred a bolder bill, but the legislature likely went as far as they could. MDE recently sent out the application for organizations to join the IZ. 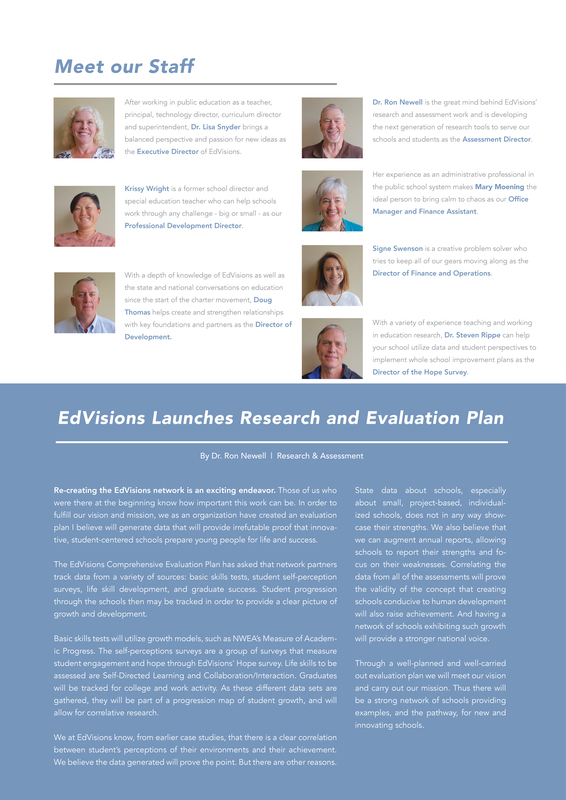 EdVisions and Education Evolving are willing to meet with organizations that have redesign in their vision. “The 2017 Legislature enacted Innovation Research Zone Pilot project legislation that provides districts and charter schools an opportunity to test new ideas in K-12 education. An application may be submitted by one or more school districts or charter schools that together to form an innovation zone partnership. The partnership may include other non-school partners, including postsecondary institutions, other units of local government, nonprofit organizations and for-profit organizations. Applicants are encouraged to think beyond continuous improvement of existing practices to try out and measure the success of innovative practices. Pilot projects must research and implement innovation education programs and models that are based on proposed hypotheses. 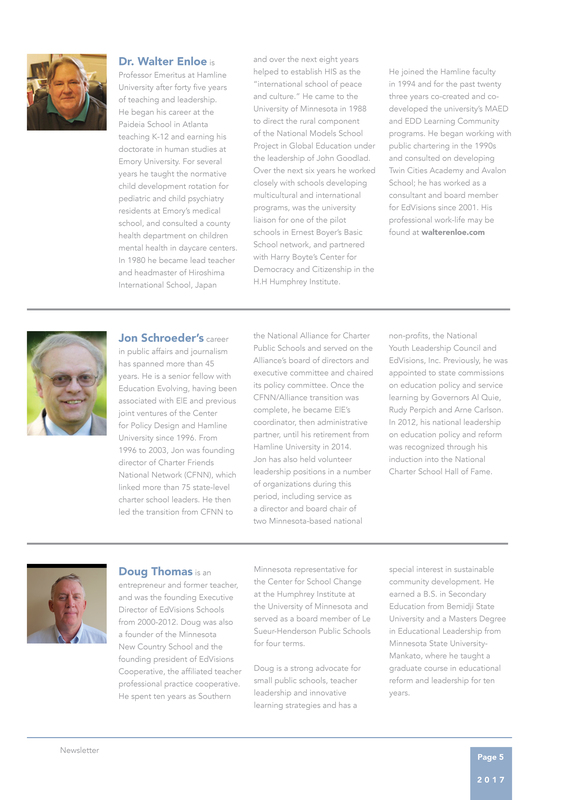 The Innovation Zone plan may include an emerging practice not yet supported by peer-reviewed research” (Source: http://education.state.mn.us/MDE/dse/zone/). 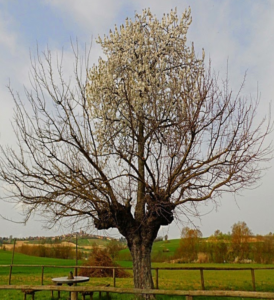 Guest Post: Small Learning Communities Revisited: Is Yours a Powerhouse? Today on the blog we have a guest post by friend of EdVisions, Nancy Allen Mastro. We hope you enjoy her insights on small learning communities! Small Learning Communities Revisited: Is Yours a Powerhouse? Students come to school motivated and ready to learn every day, but only in class projects where they find purpose, when they have choice, and when they feel a sense of belonging. If these things are absent, it is hard to engage them in meaningful academic study. How do educators foster the kind of classroom environment that inspires students to take real and lasting ownership of their learning in a way that prepares them for a future filled with promise and opportunity? One way is through creating small learning communities (SLCs). In an SLC, students learn in small groups. Teachers work closely with their students, ideally over a period of years. SLCs may be known as houses, academies, or a school-within-a-school. Sometimes an entire school may be classified as an SLC, such as in a charter or magnet school. An overarching theme may or may not be part of an SLC, but real-world application towards some stated focus is often present. No matter what type of school environment you may be in, strong evidence points to higher achievement levels and increased graduation rates when schools are organized into SLCs. Students are more likely to take rigorous, advanced courses, and they are more likely to engage in co-curricular activities. Perhaps most importantly of all, students report having more positive feelings about school when they learn in an SLC (Jimerson, 2006). But structure alone is not enough. SLCs must be viewed as a means to a better set of outcomes for students, not the desired end (Fouts, et al, 2006). Sadly, SLCs can be found in many school settings, but when subject to close scrutiny, they often are in name only. Working with a small group of students is merely an entry point to being an SLC. A nontraditional set of beliefs and core values around the role of the student and the teacher are central elements that substantially change the conditions for learning. Without those firmly in place, chairs will have shifted, but hearts and minds will have not. Well-intentioned staff will mistakenly spend the majority of their time developing protocols for managing the details around who does what, when, and where but forget to be clear on why an SLC is a powerful tool for learning. What distinguishes an SLC is its “focus on the learner/learning, and in particular, the active and collaborative nature of teachers’ and students’ work” (Oxley, 2008). This characterization of an SLC honors the personal role and responsibility that must be afforded each student if teachers expect them to embrace learning and see relevance in their school experience. Teachers must view students as full partners who bring a wealth of knowledge and skills with them to school. When this shift in mindset occurs, teachers are as profoundly affected as students. Researchers have found that teachers in high-performing SLCs commit deeply to a shared set of beliefs about teaching and learning, have higher expectations for students, and collaborate more frequently (AIR and SRI, 2006). Even when the right mindset about teaching and learning is balanced with an emphasis on the operational details, creating a high-performing SLC can be challenging. Newly-formed schools struggle with the logistics of starting a new school, and planning and implementation around SLCs can be overwhelming. Promoting enrollment, branding efforts, and starting everything from ground zero is no small undertaking. Teachers may not have enough expertise with a design model so vastly different than what they may have experienced in previous assignments. And let’s face it; they, too, are forming and norming as an instructional team. Traditional schools wanting to embed SLCs into the existing environment face even greater barriers. Any school struggles with organizational change, and because SLCs require dramatically new thinking about teaching and learning, the work of change seekers is likely to collide with the traditional notion of students as passive participants and teachers as the center of the classroom experience (AIR and SRI, 2006). This often spells disaster for a budding SLC. Time, tradition, and rigid structures can act like a storm surge that follows a hurricane and wash away well-intentioned plans in a matter of days, even seconds. We are, after all, causing a change in atmospheric conditions in schools when we try to implement new ways of doing business; days of high and low pressure are inevitable. Despite the challenges, the rewards for learning are many when schools make SLCs a central component of their program. 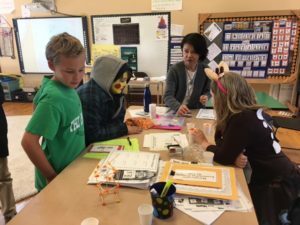 According to Barbara Wornson, Executive Director at Arcadia Charter School, located in Northfield, Minnesota, the small aspect of their learning community is what enables relationships to flourish. Arcadia enrolls approximately 120 students in grades 6-12 and has been open since 2004. Staff get to know each child on an individual basis. Students also get to know each other well. As a result, a true community is formed. Arcadia uses “lots of restorative practices, lots of circles, and lots of talking through things,” says Wornson (B. Wornson, personal communication, October 13, 2017). Students have a voice, and there is a measure of accountability that is part and parcel of being a member of the Arcadia community. Their SLC works best in the mix of classes and project-driven work they have developed. Because of the small learning community, students know the rigor expected in their projects, for which there is a well-designed process for approving, supporting, and presenting a proposal for individual study. “Students don’t fear failure or ridicule. The advisory model helps them shape their projects and the expectations around them. Still,” Wornson cautions, “size is not a panacea.” Some students have special needs that require supportive attention. And while it is exciting that students can work at their own pace, finding enough mentors has been challenging for Arcadia. Mentors from the community provide a significant level expertise to students when studying their topic of choice. To meet the demand for the number of mentors needed, they leverage volunteers and partner with an array of community entities. Wornson encourages others utilizing SLCs to be sure to “put legs under their mission and vision.” Resources will be slim, she says, and you have to be creative. If you want to succeed in creating a high-performing SLC that takes teaching and learning to a new level, it is wise to take the long view. Whether you are in a start-up school or a traditional setting seeking to create an SLC, the model must be allowed to evolve over time. If your SLC has been in place for a while, it may be time for a deep look at how well it is meeting your desired expectations. An SLC is not a structural element, as the name would suggest. As stated earlier, shared beliefs and actions grounded in those beliefs are what activate the power of an SLC, not the size of the group alone. The people at the center of your SLC – students, teachers, and parents – need frequent opportunities to explore and articulate their beliefs. This will enable them to move from individual understandings to framing a collective set of shared ideals that are highly tangible through school practices. Only then does an SLC become a compelling way of being. Nor is an SLC is a methodology to master. An SLC matures over time; therefore you can and should expect multiple iterations. Change will be constant, and it will require attention that will need to be sustained over a span of years. An ongoing focus on the health and vitality of your SLC should always be part of your continuous improvement process. A robust set of guiding questions, strategies, and tools to position your SLC for success no matter where you place yourself on the development continuum will help make this possible. From High School to Learning Community is comprehensive and written in a succinct and reader-friendly way. It includes a look at the research supporting each domain, a rationale for why it is an essential element, and specific, actionable things you can do to take your SLC to the next level. 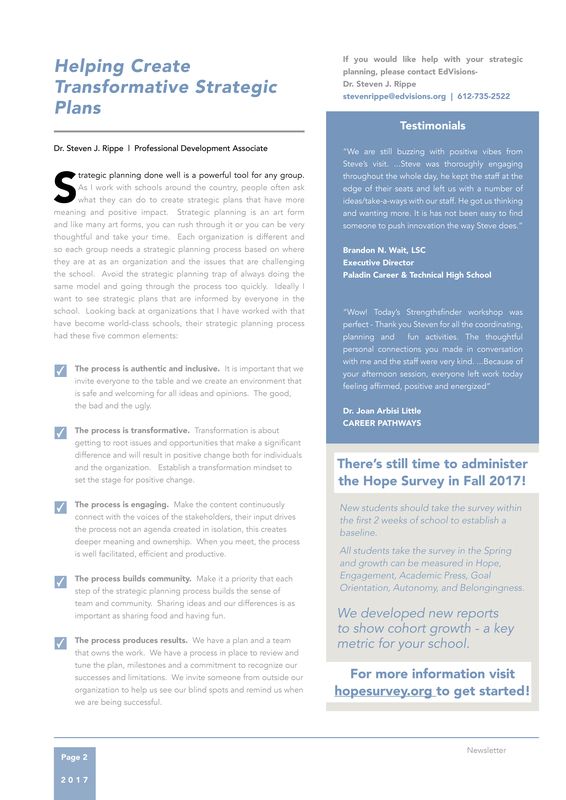 There is a working checklist for each domain and well-designed tools for practitioners, including things like suggestions for team composition, sample schedules, tip sheets, advisory models, strategies for working with parents, and how to individualize professional development. There is even a team-led inquiry model. If used with intentionality, this guide will help to ensure precious time is focused on meaningful dialogue and purposeful action. Another smart way to invest in your SLC is to enlist the help of people who can guide and support your vision for what you want your SLC to become. EdVisions offers several means by which they can assist you with a personalized approach, tailored specifically for you and your school. What sets EdVisions apart from similar development organizations is their emphasis on a holistic approach. According to Doug Thomas, Director of Development at EdVisions, transforming schools is hard work that takes time. The size of schools alone is a big part of what needs to change. Smaller is simply better; schools can be much more personal for students – and staff as well. But, he points out, “Small schools by themselves are not the answer. To redesign, you need to reallocate.” (D. Thomas, personal communication, October 22, 2017). As an evangelist for innovative practices since EdVisions began in 2000, Thomas knows the challenges in creating small learning communities and cites the typical barriers to transforming schools, including school culture, leadership – even our own time spent in the classroom as a student. Unfortunately, much of what works best for students is counter to what many of us have personally experienced. The Ed°Essentials outlines the four major components of the work EdVisions focuses on with schools. To talk with EdVisions about how they can support your small learning community and make it a powerhouse for learning, contact Doug Thomas at 612-290-1708 (cell) or 612-601-1603 (office). You may also email him at dougthomas@edvisions.org. (For more from Thomas on what is needed to ensure a successful initiative, see his article in EdVisions’ October newsletter entitled What It Takes to Successfully Launch an Innovation (p. 5). American Institutes for Research and SRI International. (2006). Evolution of the Bill and Melinda Gates Foundation Grants Initiative: 2001-2005 Final Report. Menlo Park, CA. Prepared by the National Evaluation of High School Transformation, Washington, DC. Fouts, Jeffrey T., Duane B. Baker, Carol J. Brown, and Shirley C. Riley. (2006). Leading the Conversion Process: Lessons Learned and Recommendations for Converting to Small Learning Communities. Fouts & Associates, Tucson, AZ. Jimerson, Lorna. (2006). The Hobbit Effort: Why Small Works in Public Schools. The Rural School & Community Trust, p. 5, cited in Pubs.cde.ca.gov/tcsii/ch5/smllrngcmunities.aspx. Oxley, Diana. (2008). From High School to Learning Community: Five Domains of Best Practice. Northwest Regional Educational Laboratory, Portland. Teaching and learning is clearly a human-centered enterprise based on relationships. But as humans, we have a need to understand why-especially when it comes to change. This gets tricky because each of us has to construct our own understanding through our learning and collaboration with others. When we learn from another, share our practices, our failures and our successes, we all grow. In recent years, I found this picture, that for me, provides a visual representation and unique metaphor of the transformation that is happening in K-12 public education. The established tree represents the strong foundation of public schools; a strong tree with many branches that have grown strong over the years that represent our diverse system of grade levels, content specialties and programs. The tree has continually reached for the sky to grow, adapt and thrive. Studying the tree more closely however, a new, blossoming tree can be seen growing out of the established tree. This new tree represents the new ideas emerging in schools, the increasing needs of society and of our students that are now essential for success. The established tree seems to be nurturing the growth of the new tree even as it still stands strong and proud on its own merits. Eventually like every tree, the older tree’s life cycle will end, but as it does, it will continue to feed the new tree as it lays on the ground nourishing the earth with its memory. So is our system willing to do this? Are we willing as educators willing to continually improve our foundational system while also allowing new ideas and methods to emerge and grow? Are we willing to let the new system stand proudly on our strong shoulders and blossom for all to see? This is not easy work. It goes against much of our basic human behavior to allow contradicting beliefs to exist in the same system. Recently, I read a best-seller by scientist, Sean Carroll called, “The Big Picture” which attempts to summarize all that scientists know to date about our universe and why we exist. As the author discussed the many times that scientific discovery contradicts with our previously held beliefs, I couldn’t help but make connections to what is happening in public education as well as many other sectors that are responding to the changing expectations. Carroll stated, “When two dramatically incompatible beliefs come into direct contact, it can be like highly reactive chemicals being mixed together, leading to an impressive explosion-possibly even blowing the entire “system” apart until a new one can be assembled from different parts.” Instead of a grand explosion, he suggests we continually test and probe our beliefs for inconsistencies and structural deficiencies and be willing to improve the “architecture and composition even to the point of replacing our beliefs with better ones.” In the end we have to be willing to change our beliefs in the face of new information. To this end we have to allow teachers and staff to test new theories; even if they are incompatible with past practice or prevailing beliefs. After all, shouldn’t we as educators be the first to question how our systems actually work? While our critics assert our pedagogy lacks relevance in the world today, should it not be us who lead the dialogue on questioning our practices? I believe in public education, so I sincerely believe that public education can meet the needs of our students in a responsive, relevant and personalized manner and that public schools are willing to adapt our approaches and practices to meet the needs of a global citizenry. Our national strategy should be around teacher empowerment to personalize learning. Our teachers are closest to the challenge. What are the essentials for this to occur? Philosopher Thomas Kuhn conceptualized the term “paradigm shift” to describe how new theories can help us think of the world in new and different ways. We have to believe in human potential-in our high quality educators. We have to know that innovation requires a certain amount of uncertainty, and that we can handle it. Educators must consider new and emergent practices as objectively and openly as possible and embrace the cognitive dissonance created through this dialogue. Educators must allow their colleagues to research their questions and test their hypothesis. Do you have a voice in what you do? In the system? In how to personalize learning? In how to raise student engagement? In how to raise achievement and results? Do you want to be a positive voice for our students’ futures? I invite you to have a voice in the system. Help solve complex challenges such as personalizing learning and work as innovative partners in creating more transformative learning experiences for our students. Guest Post: CSC’s Dual Enrollment/Credit work helps students and schools. Today on the EdVisions blog, we have a guest post by Joe Nathan of the Center for School Change. We hope you enjoy learning more about one of our affiliate organizations and their efforts to improve access to education in Minnesota! Since 1988, the Center for School Change has been working to expand dual credit opportunities for Minnesota students, and dual credit resources and support for students. The CSC, an affiliate of EdVisions, was active again in the 2017 legislative session, scoring victories for educators and students. CSC and Minnesota Association of Charter Public Schools helped convince legislators to what could be called at “double PSEO tax” on charter public schools. As it did with traditional district public schools, MDE was deducting from the state per pupil aid a percentage based on the number of students taking PSEO courses, and the amount of time they spent on PSEO. However, MDE also was deducting funds from a charter’s “Lease aid” based on PSEO participation. CSC and MACS convinced legislators that this was an unfair “double tax.” The 2017 Minnesota legislature eliminated it. Second, for several years, CSC has worked with other groups to double financial support for college in the schools/concurrent enrollment courses taught in high schools, from $2 to $4 million per year. CSC helped lead efforts with others to delay implementation for 5 years of questionable demands by the Higher Learning Commission regarding required degrees and coursework of CIS/CE high school faculty. We also won state support for teachers who are working toward these credits. CSC continued worked with families and students to help strengthen the PSEO law. This year, legislators agreed to require that all public schools (including charters) must provide space, computer and internet access, allowing students to take PSEO courses “on-line”, in the school. Finally, CSC, High School for Recording Arts and Migizi Communications high school students have created free, “hip-hop” videos in 7 languages (scroll down to view), promoting various forms of dual credit.